DEVOUR : On Bookshelves Now! It’s been a long time coming, but today DEVOUR, my debut novel, hit the bookstores. 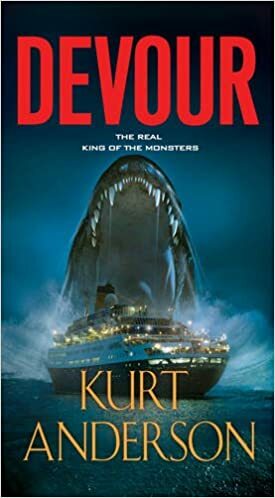 DEVOUR is a tale about a primordial sea creature that has survived millennia after millennia through adaptive hibernation, awakening only to gorge itself and reproduce. A super predator from the past, it has all the tools to cause massive destruction. But this time, when it awakens in the uncharted territory under the Arctic ice, its food base has all but disappeared. Time to head south, to other food sources….and a rendezvous with a very unique cruise ship. DEVOUR was a lot of fun to put down on paper, and I hope you’ll enjoy reading it as much as I enjoyed writing it. Feel free to drop me a line or post a comment to share any feedback. In the meantime, it’s worth remembering that, as we move into summer months and the bathing suits come out, as we start wading into waters cool and warm, the deep blue is the last uncharted territories we have. It is full of mysteries…and most of them are very, very hungry!